What is the list and library filters pane? The filters pane can help you find the file or list item you’re looking for. 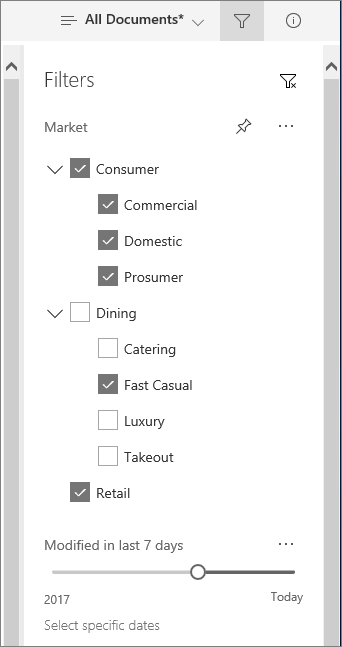 When you make a filter selection, items that don’t match are removed from the list shown on the page. Click the filter icon at the top right of your list or library to open the filter pane. The filters you see are based on the list items currently in view. For document libraries, you can filter for recent files only, view files edited by one or more people, or display only files of a certain type, like Word documents and PowerPoint slides. If your columns are based on Managed Metadata term hierarchies, you can filter on the parent terms, as well as single items. The first 140 terms show in the filters pane. 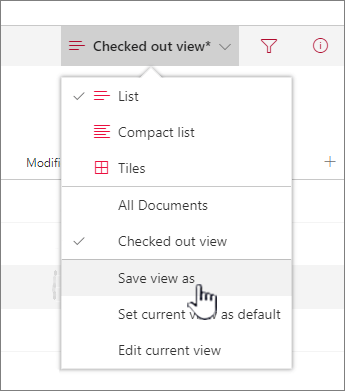 When you’ve filtered the list or library and want to go back to where you started, click the clear filter icon at the top right of the filter pane. 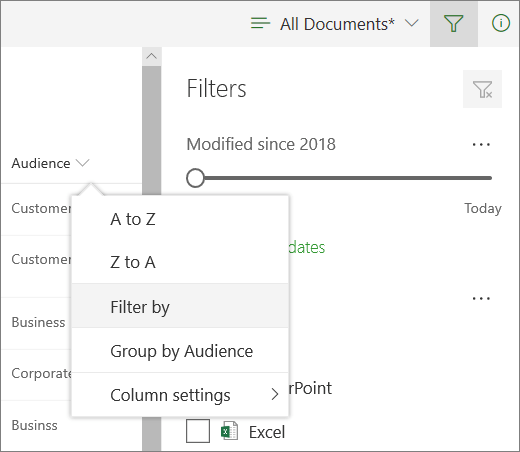 The filters pane works together with SharePoint features you may already be familiar with like column headers and views. Depending on the column type, you may see filters to set in the column header dropdown or click Filter by to open the filter pane. Filters selected in the column header menu also show on the filter pane. And, it works the same way in reverse. Selections made on the filter pane show in the column header filter selections. Views allow you to save your filter selections. SharePoint help contains many more articles that cover Documents and libraries and Data and lists. For more help specific to your organization, contact your IT department or administrator. If you're a SharePoint Online administrator, you can also open a support ticket in the Office 365 admin center.